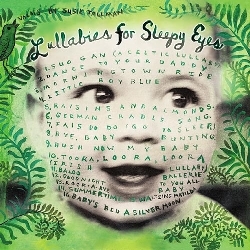 Lullabies for Sleepy Eyes, the second CD release from Rock Me Baby Records, proves once again that a lullaby can be comforting enough to calm a child and at the same time complex enough to please a parent. This diverse 16-song collection offers folk-renditions of lullabies from Welsh, Scottish, Irish, Yiddish, French and Australian traditions, among others. Although the lullabies are aimed for children ages one to five, the familiar, soft melodies work wonderfully for infants as well. With this album, Vocalist Susie Tallman provides a distinct sound much different from other children's albums; Lullabies for Sleepy Eyes is not tinny and sparkly but warm, clear, and textured . gentle music that will link parent and child in the extraordinary way that only a lullaby can.